In the center of the Shonai region of Yamagata Prefecture lies Tsuruoka City where samurai warriors of the old Shonai Domain switched their swords for hoes to create the Matsugaoka Reclamation Land. In the process, they built the northernmost silkworm farm in Japan that eventually became the country’s largest and the only remaining place to maintain the complete process of silk production, from silkworm breeding to production of goods. Besides Matsugaoka, Tsuruoka is also home to Tamugimata village, a small township alongside the Rokujirigoe Kaido where a four-storied farmhouse still stands that once housed both farmers and silkworms under the same roof. 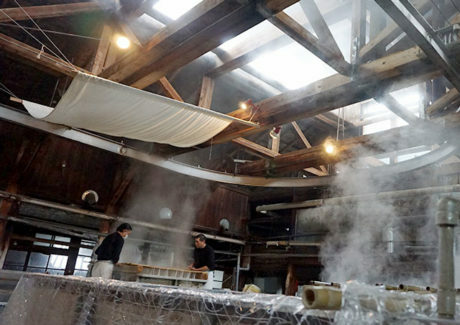 This marks the only location where a silk refining process dating back to the Meiji Period (1868-1912) still exists, and along with preserving the history and culture of the silk industry, is a location striving hard to create a new cultural value for silk. 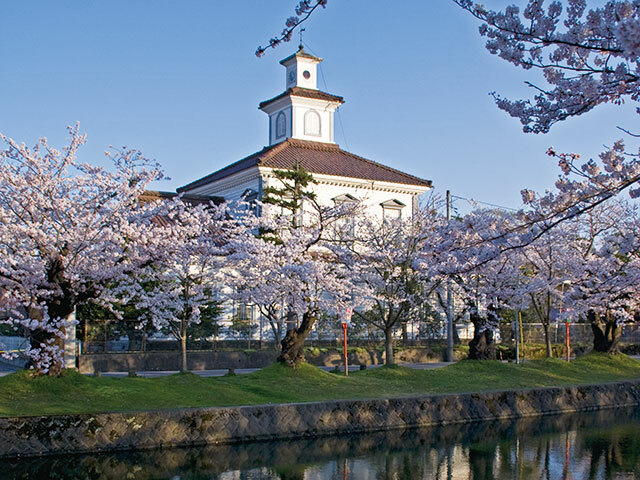 A visit to Tsuruoka will not be complete without witnessing first-hand the townscape built by the ancestors of a Japan in the throes of modernization. 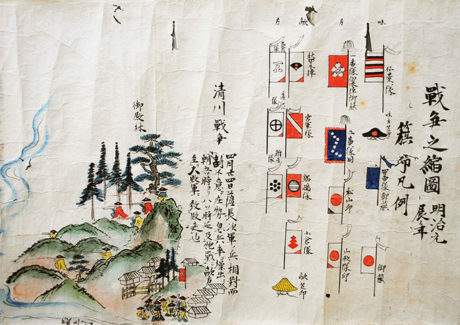 Surrounded by defeat and in a bitter fight to the end, the Shonai Clan valiantly held off while giving away zero territory to the enemy Imperial Court and Aizu Clan (among other clans). This wasn’t enough, however, as the Shonai Clan surrendered knowing defeat was imminent, and soon they were instructed to relocate their Daimyo (clan lord) to another domain. 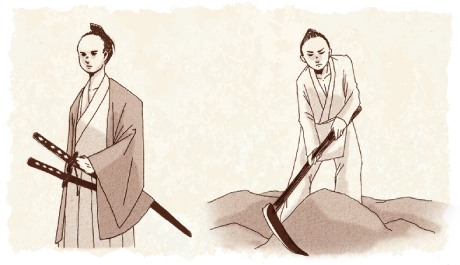 A donation of 300,000 Ryo allowed the Shonai Clan to retain their land, a soft punishment thanks to the instructions by Saigo Takamori that was negotiated with the former Daimyo, soldiers, and Karo (chief retainer) on their visit to Kagoshima. One of the retainers present, Suge Sanehide, proposed that in order to contribute to the modernization of Japan, the Shonai Clan cultivate the nearby untamed land and in place plant mulberry trees to grow silkworms. Saigo agreed, and thus started the Shonai Silk industry. 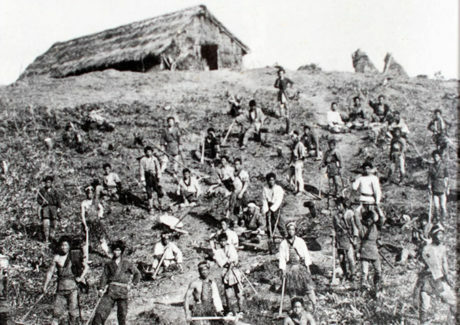 Following the Meiji Restoration in 1868, around 3,000 former Samurai (and an estimated 500,000 other workers) of the Shonai Clan picked up hoes in place of swords and began to cultivate the land while establishing the largest silkworm breeding business in Japan at the Matsugaoka Reclamation Land. 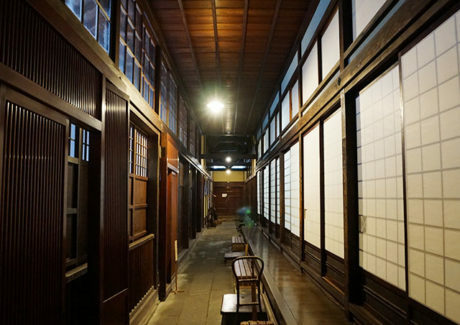 This place was at the forefront of the silk industry that provided the backbone to the modernization of not just Shonai, but to the whole of Japan. Besides becoming a major impetus for the prosperity of the silk industry centered in Tsuruoka City, The Matsugaoka Reclamation Land also had a significant impact on the culture of the region. Samurai workers across Japan reclaimed a lot of land and turned it into ordinary farming communities at the beginning of the Meiji Period (1868 onwards). Despite this, the Matsugaoka Reclamation Land has maintained the original look and feel of the time, and has since become an excellent example of how to preserve the facilities, lands, and management policies lasting to this day; an extremely rare example of the history of the cultivation of Japan. One of the core policies of the Matsugaoka Reclamation Land states: “act moral as you create an industry, report to the country, and this in turn will become a model for all”. This policy could hold the secret as to how this area was able to become the only place in Japan where the intangible cultural property that is the complete process of silk making, from harvesting, to weaving, refining, and printing, is still undertaken, and has been passed on as a “living” industry to this day. Known for its multi-storied folk houses, Tamugimata is a settlement in Tsuruoka City that played a major role in the development of the Matsugaoka Reclamation Land located alongside the Rokujirigoe Kaido (ancient trade route) that links the Shonai and Murayama regions. Raising silkworms became a popular way to make money around the middle of the Meiji Period (1868-1912), which is when the floors above the second floor of the farmhouses were turned into hatcheries. As the settlement is located among steep mountain slopes, there is only limited land available for housing, not to mention the place is famous for heavy snowfall during the winter. As such, new construction or extending buildings was too difficult, so the multi-storied houses were repurposed to house both people and silkworms under the same roof. Each floor had a different purpose. The owner and their family lived on the first, workers lived on the second, silkworm breeding took place on the third, and the fourth floor was used for storage. 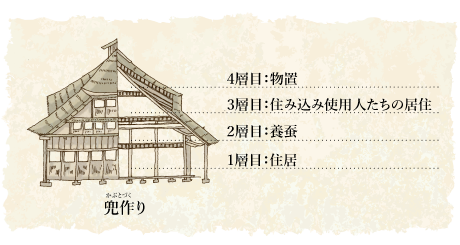 At that time, the attic was renovated to increase efficiency by curving the roof to create openings called Kohappo on each of the four sides, bringing in sunlight and letting out smoke. This made the roof look like a samurai helmet when viewed from the side, leading to the style being named “Kabuto Tsukuri” (lit. helmet style). The curvature of the house fits perfectly in its natural surroundings to create a beautiful design full of character. The Kazama family were at the heart of the development of Tsuruoka’s silk industry. Purveyors to the former Shonai Domain that at the time was under rule by Tsuruoka Castle, the family provided capital investment for the silk industry, later becoming the wealthiest merchants in the city, and providing backing for the revitalization of industry in Tsuruoka. 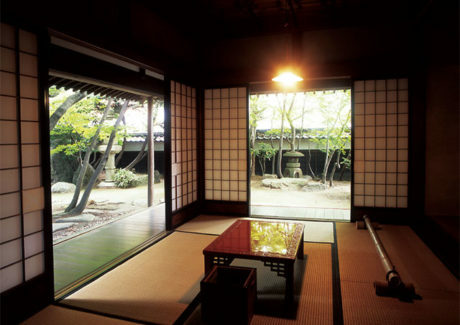 In 1896, the seventh-generation head of the family, Koemon Kazama, built Heishindo on the remains of a former samurai home, which then became the family’s home and the center of operations for the business. Characteristics include the Samurai house gate from almost 200 years ago, the roof weighted with around 40,000 stones, the four storehouses that make up the main building, and the big frames of the mainstay that remain to this day, remnants of the prosperous times in the merchant family’s history. 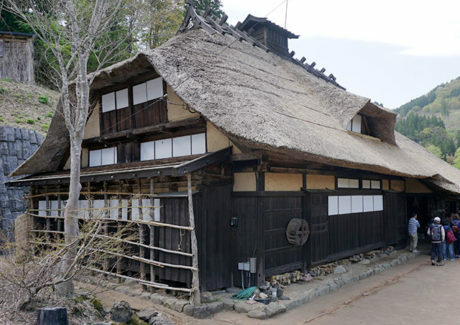 The Chido Museum in central Tsuruoka has a multi-storied folk house on display that was moved there from Tamugimata. The Former Nishitagawa-gun Government Office located in the same complex was used for issuing loans for mulberry plantations, and important tasks during the Meiji Period. Also, the Uzen Refinery built in 1906 produced Habutai silk for export, with all processes, from growing silkworms, to silk reeling, weaving, refining, and dyeing or printing were exclusively undertaken in Shonai, with the Meiji Era factory and office built in 1940 still in use. 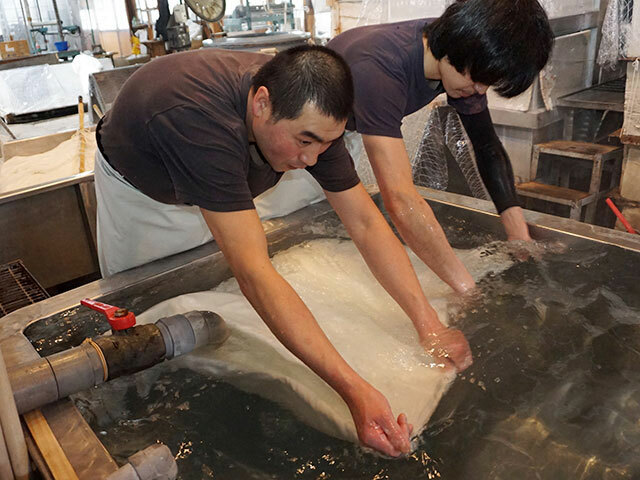 As such the history and culture of the silk industry in Tsuruoka has been preserved, while also offering a glimpse into a remaining historical heritage. 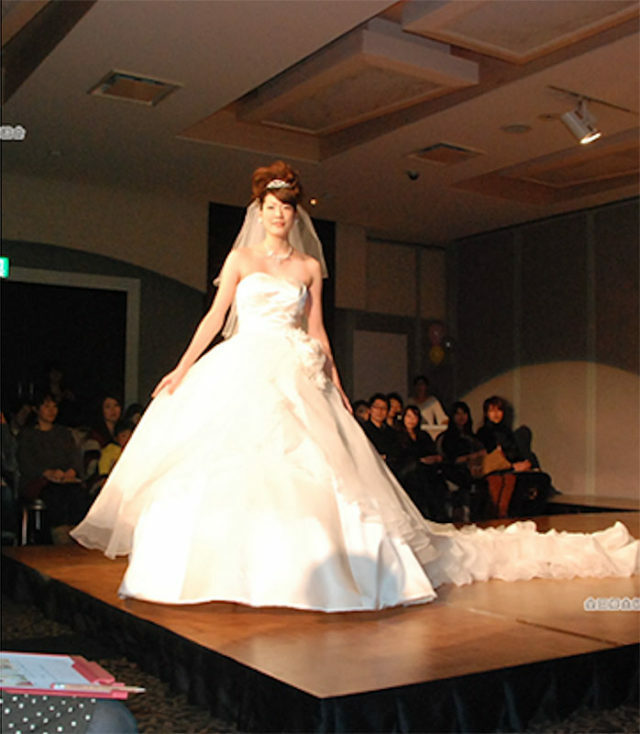 Currently in a project called “Silk Girls’ Collection”, students from Tsuruoka Chuo High School produce dresses out of Tsuruoka Silk, and the newly designed kibiso silk produced in Tsuruoka offers a new way to spread Japanese silk throughout the world.